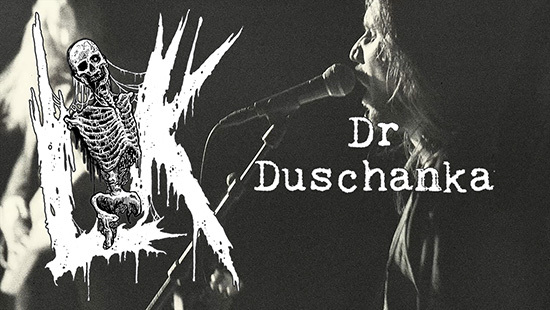 LIK releases video for 2nd single ‘Dr Duschanka’! New album ‘Carnage’ out May 4th! Death Metallers LIK from Stockholm, Sweden have just released the 2nd single taken off their new album ‘Carnage‘ to be released May 4th via Metal Blade Records. In the dirt where fallen idols lay to rest, the maggots and seeds in 2014 spawned a new creation. This took the ugly form of LIK, which fittingly means corpse in Swedish. An un-dead creation which offers a plate of savory old school death metal. Walking the earth for three cold winters, and with the first offer named ‘Mass Funeral Evocation‘ in 2015, it’ll have a sister released in May of 2018. Through iconic Metal Blade Records, ‘Carnage‘ will reach even further in the quest to spread the beauty of imperfection. Responsible to capture this on tape was once again Lawrence Mackrory (Darkane, F.K.Ü). This time things where stepped up a notch as the recording took place in the famous Dugout studios in Uppsala where Daniel Bergstrand also added some spice to the infernal stew. In the land where the craft is polished to resemble something else than brute reality, LIK has no passage as this entity is devoted to make a permanent mark in those who lay down their souls to rock’n'roll. That’s why the recipe will always, and has always been, to record as much live as possible. Keeping editing to a minimum offers a “what your hear is what you get” experience. That’s why it feels like you’re on the spot at a live gig, rather than a calm studio environment when you spin the disc.